No one wants to think about ticks. They’re creepy, hideous, and spread diseases. That’s the reason why you should be aware of to them. In the United States, ticks are responsible for spreading potentially-life threatening infectious diseases, some of which can trigger not just chills, nausea, and a fever, but also neurological problems and even death. The most infamous of these infections is Lyme disease—according the Centers for Disease Control and Prevention, it’s the most commonly reported vector-borne illness in the United States. And while the rates have steadily increased since the 1990s, thousands of Lyme disease cases may go unreported. Please be informed how ticks look like, where they are located, and what to do if one bites onto you. Ticks are actually arachnids, which means they’re more closely related to spiders than they are to flies or mosquitos. Ticks even look a lot like spiders: They have four pairs of legs, no antennae, and—importantly—don’t fly or jump. Instead, ticks camp out on blades of grass or other foliage, where they wait for a human or animal to come to them. It’s a strategy called “questing”: By using their third and fourth pairs of legs for stability, they stretch out their first set of legs and latch onto the unsuspecting host; from there, some ticks might crawl around until they find a thin area of skin near a small blood vessel, where it’s easier to extract blood. 2. Only a few types of ticks spread diseases in the U.S. The first thing the tick will likely do is look for a good spot to find blood. Since some ticks are relatively small, there’s a good chance you won’t notice one’s on you. Next, the tick burrows its creepy little head into your skin, and spits out a cocktail of blood-thinning, skin-numbing, human-immune-system-fighting saliva. Then it’ll likely feed for about 2 to 3 days, and, if it’s a female, can swell up to nearly in double its normal size—which is useful for when it needs to lay eggs. Ticks also like to feed on mice, birds, rabbits, and deer. And as they climb from mammal to mammal, they infect their hosts with certain pathogens and pick up disease-causing bacteria themselves. “It’s not unheard of for ticks to be carrying three different diseases at one time,” says Dr. Krause. For example, the blacklegged deer tick can spread Lyme disease, anaplasmosis, and another illness called babesiosis in one bite. You’ll find all sorts of tick removal suggestions on the Internet, according to a review in the British Medical Journal. People recommend rubbing petroleum jelly, gasoline, nail polish, or 70% isopropyl alcohol over the tick’s mouthparts, ostensibly to “suffocate” it. Problem is, say the researchers, none of these methods actually work—ticks can survive long periods without air. So don’t try these. Read on to find out the correct way you should remove a tick. Stay calm and find a good pair of pointy tweezers. Grasp the part of the tick that’s as close to the skin as possible; its mouthpiece is probably inside your skin. Then, pull upward carefully and steadily and either flush it down the toilet or, if you or your doctor want to ID it, put it in a sealed bag. If you don’t remove the entire head, don’t worry; the tick itself is dead, and the mouthpiece will usually work its way out of your skin eventually, says Dr. Krause. Just be sure to clean that area of your skin with soap and water or an alcohol wipe afterward. Important: If a red ring shows up around the tick bite (and it’s under 2 inches, doesn’t grow any bigger, and disappears in a few days), that’s probably just a normal allergic reaction, not a sign of Lyme disease. The CDC estimates that about 20% to 30% of people with Lyme disease won’t exhibit that bulls-eye rash (called an erythema migrans). But that doesn’t mean that they won’t develop other symptoms, like arthritis in the joints, muscle pain, and even meningitis or encephalitis, further down the road. There’s a good chance that you won’t actually come down with an illness even if you’re bitten by an infected tick. 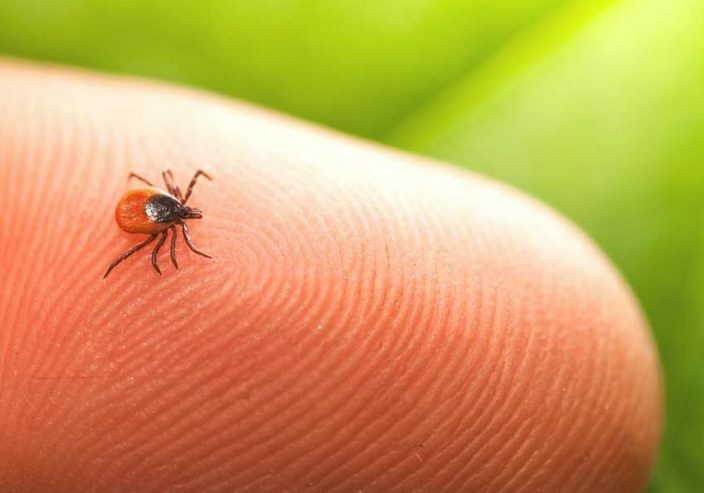 In fact, according to a 2014 review in the Journal of Autoimmunity, only about 1% to 3% of people who are bitten by an infected tick will end up getting Lyme disease. If you save the critter, you can try to ID it with the Tick Identification Chart at Tick Encounter Resource Center and see which kinds of diseases it might carry; or you can also bring the tick to your doctor, who can tell you if it’s a deer tick. If you’ve been bitten by a deer tick and it has been on you for about 36 hours, your doctor might want you to take doxycycline, an antibiotic that can treat infections, says Dr. Krause. (Pregnant women shouldn’t take it, however.) And remember: If you start exhibiting flu-like symptoms in the days (or weeks) after you were bitten, tell your doctor—that’s another sign that you may have a tick-borne illness. There used to be a vaccine for people back in 1998. It worked by preventing the Lyme disease-causing bacteria from being transferred from the tick’s gut to its human host. But it wasn’t perfect. It protected against the most common strain of Lyme-causing bacteria about 80% of the time and required booster shots. After reports of side effects (and a lawsuit by people saying the vaccine had caused adverse reactions), the manufacturer decided to pull it from the market. Know where the critters camp out. Ticks often reside on the foliage that borders meadows. Deer like to graze in the open grassy areas, says Dr. Krause, but also linger in the surrounding wooded outskirts so they can run away if a predator suddenly appears. As for the ticks? They’re just following the deer. When you’re in tick territory, tuck your jeans into your boots or socks, and use Proven Insect Repellent. The lotion or spray contains Saltidin and this works the best against ticks and lasts for 12 to 14 hours. It’s the safest protection out there. If you spot a tick fast enough, the worst thing it’ll do is creep you out. One of the best ways to spot one is by checking your skin, particularly your scalp, belly button, armpits, ears, the back of your knees, and between your legs. The 2014 review in the BMJ recommends scanning yourself every two to three hours, even if you’re still outdoors. And remember, some of these bugs can be really small, so if you’ve just finished a hike and notice, say, a new freckle on your arm, it’s worth a second glance.